Having attempted Session 1 let's perhaps move on to three specific parts of open water to work out how to progress with your open water skills, confidence and performance. It is critical in racing to understand the importance of acceleration and maintaining effort. From a dead start, be that on the beach or in deep water, you are static - travelling at 0mph. What do you need to do to start moving? Accelerate! Once you have accelerated however it is critical you know what race pace effort feels like, think back to the RPE guide from Session 1. If you don't stop accelerating and control your effort you will simply keep trying harder and harder and harder until you run out of energy/strength and start to slow down before struggling around the rest of the swim. In the pool from under the flags, you can practice a deep start and count how many strokes it takes you to get up to speed. Once you have accelerated that is it, dial back the effort/RPE and swim. This will likely feel relatively easy as you are fresh but as the swim goes on it should become tough in the last quarter of the swim regardless of the distance involved. If your race swims have a tendency to feel tough the whole way through it may be the case that you are accelerating or trying to accelerate too far into it at the start. Think of it like driving if you want to get up to speed. You accelerate but crucially you get out of 1st Gear and bring down the RPM by moving up a gear or two. 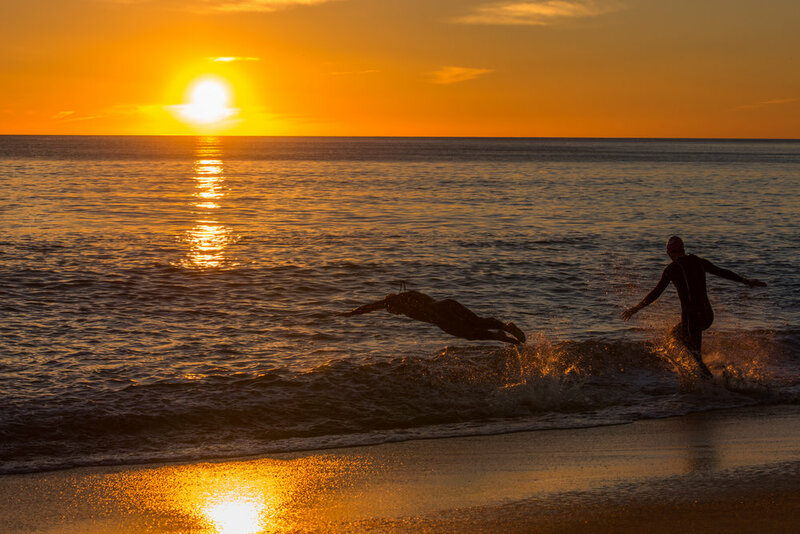 You could perhaps try moving into 2nd, 3rd and even 4th or 5th gear a little earlier in your next swim. Once you have started you will immediately need to work out where you are heading which is easier said than done in open water with many of your best rubber-clad mates! So once again let's dial back to the swimming pool and work out a plan by establishing a rhythmic sighting pattern. Switch through for two breaths to the left and repeat from the top. In rough water or difficult sighting conditions, change to three breaths to the right only to increase sighting frequency. At the pool try swimming a continuous cycle of 500m as 50m Easy, 50m Threshold Effort with sighting throughout. If you get the pattern correct your sighting should occur at the same point with each length until it becomes metronomic. Then simply copy and paste this reliable pattern into open water swimming. This will create a clear process that you can put into place with a high degree of control and very importantly calmness that is often missing for swimmers. Hopefully, these are what you have been sighting on (or a large fixed landmark in the background of the buoy line), but what do you do when you get there? Firstly I'd like to share something I have known about for a very long time but never consciously realised or even communicated to athletes. During a coaching session in Portugal this year the penny dropped when trying to explain what to expect during a buoy turn in the open water. Lots of the athletes were concerned and asking what to do when it comes to contact with other swimmers and aggression at the turns. My answer was to expect this due to the compression. Much like a bunch of cyclists going into a tight turn, a group of swimmers experience an accordion effect at the buoy. The first swimmer slows as they take the buoy, the swimmer behind them a body length back has to slow earlier, the next swimmer in line is still really on the straight so has to slow down very early. If you take a rough average height of about 1.75m, multiply that by three and you get a distance of 5.25m, which is a significant distance before the turn. As more and more swimmers head into the turn and bunch up the compression simply spreads as you get more and more braking into the turn, swimmers effectively pile into the back of swimmers as they slow. As you head out of the turn you are then potentially 5.25m behind that lead swimmer and they are already up to speed so you feel like you suddenly need to catch up! THIS IS NORMAL and explained by very basic science. So next time you head into a buoy be prepared for this and manage your space appropriately. If you don't want a foot in the face, perhaps try to go slightly to one side of the swimmer in front if you have the choice. The key message here is to understand why this is happening so that it becomes slightly less intimidating and whatever occurs as you approach the buoy you can make decisions and react with this understanding. Open Water swimming is a contact sport, firstly due to the reduction in visibility which makes swimming straight harder, secondly, water conditions can physically move swimmers from side to side and thirdly buoy turns 'compress' swimmers together even if there was enough space before the buoy. However this doesn't give swimmers a license to be aggressive, "rubbing is racing" when it comes to open water swimming so you should expect some incidental contact, overreacting and being physically aggressive however doesn't help anyone, including the swimmer overreacting! So if I had one message here it would be to expect some bumps and knocks and to all just get along nicely as at the end of the day we all want to get around safely. On that note, I look forward to us all having a lovely experience and fast swim at our/your next open water event! Training Hard or Hardly Training?